It is our greatest pleasure to serve you traditional Japanese and Thai cuisines with house specials. 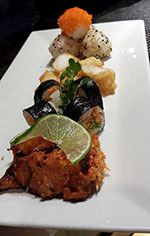 We are proud of our contemporary sushi and “Baltimorean” inspired dishes. We are a casual, family friendly establishment located in Towson, MD since 1997. San Sushi Too’s sushi chefs are known for their highly imaginative creations, like their signature “Dyanmite Roll”, and the famous Terp Roll, crispy shrimp tempura/avocado rolled up with creamy crabmeat with roe and teriyaki sauce on top. 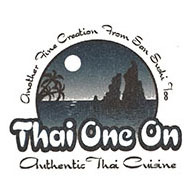 Thai One On’s chefs are known for their delicious Pad Thai, Drunken Noodles & Curry. For the true Marylander, you have to try our house curry with soft-shell crabs. The Buddha Lounge AKA The "B" Lounge is located in the heart of Towson, MD, We have a young and vibrant atmosphere reflecting the professionals and university in the area. Comfortable seating area, cocktail bar, and dance floor where you can relax or dance the night away. The party is at The B Lounge. Copyright 2008 San Sushi Too & Thai One On, All Rights Reserved.